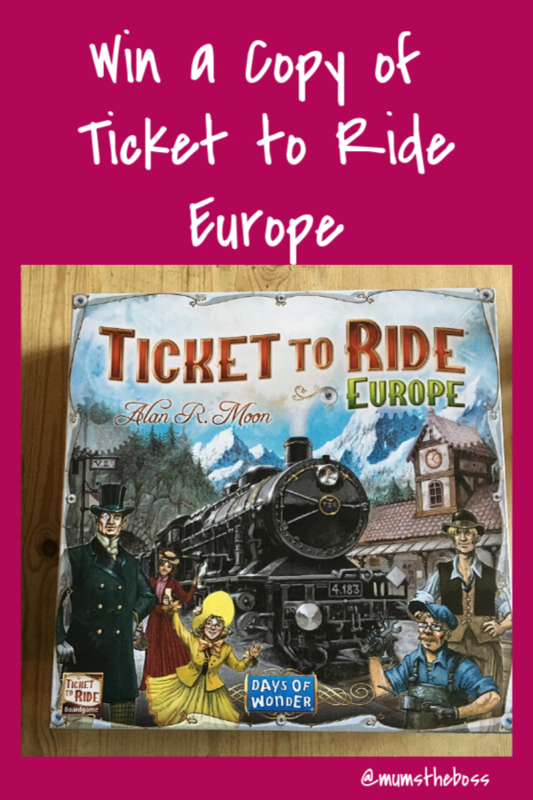 We’ve reviewed the game Ticket to Ride on this blog before and it is rapidly becoming one of our family favourites. But Asmodee games contacted me again and asked me if I could review it, and I agreed if I could give the second copy of the game away to one of my lucky readers. 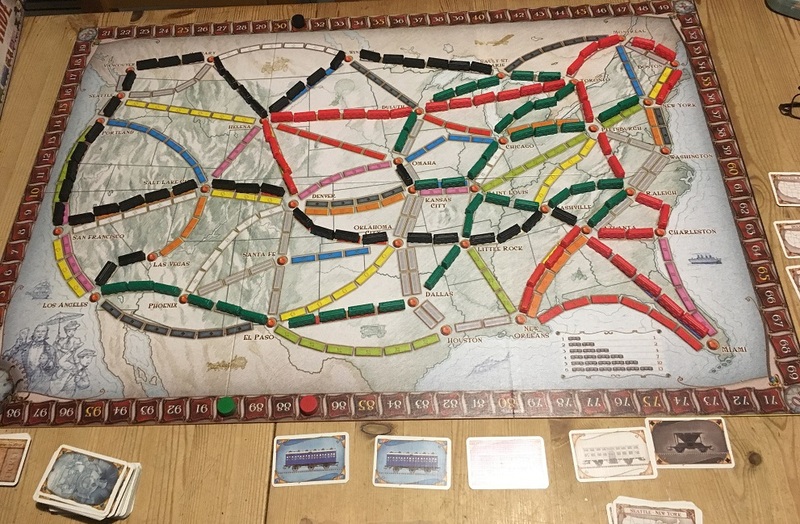 Over the last weekend, we finally managed to persuade dad to come and sit down with us and play Ticket to Ride, and it was a complete ding-dong of a game. 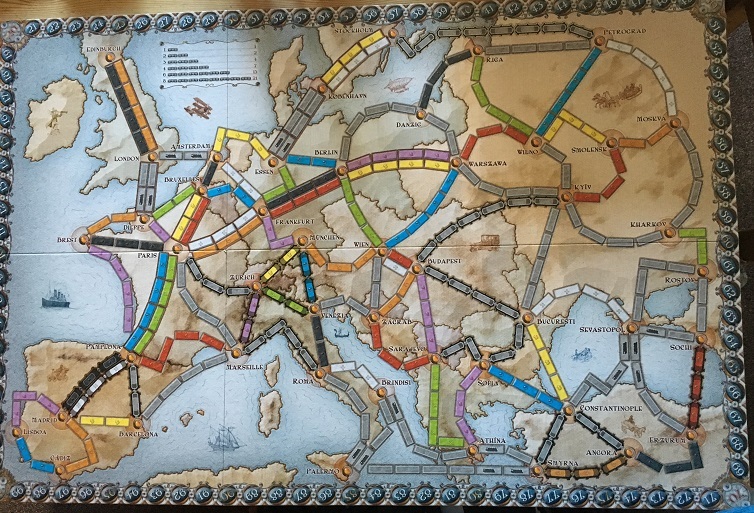 As you can probably see the object of the game is to claim train routes between cities in America. You get points for claiming short routes between two cities and bigger points at the end for constructing longer unbroken routes between cities. The thing that makes this game so good is that there is a big reveal at the end in which lots and lot of points are added and subtracted. So, unlike most games, it is almost impossible to know as the game progresses who is winning. So everybody stays upbeat for the whole game, unlike some games where I have found my children’s’ attention span and morale wandering when it becomes clear they are not going to win. In the game above my son (playing black) successfully completed three long routes and ended up winning the game. I played red – I successfully completed four short routes and one medium length one, but my failure to complete the long one that I had (I was one card short! ), meant that I lost a huge number of points and finished up last. Dad on Green, mmmananaged to complete a lot too, but one route he had was blocked off right at the beginning as the two routes to a station he needed were takekn by othehrs. So he learned the lesson for next tie to grab the criitical routes early. All in all, it was a great game and we were still discussing it days afterwards. I know we will go on to play this game many more times, and I’m hoping that soon we will be able to get all four of us around the table to play. 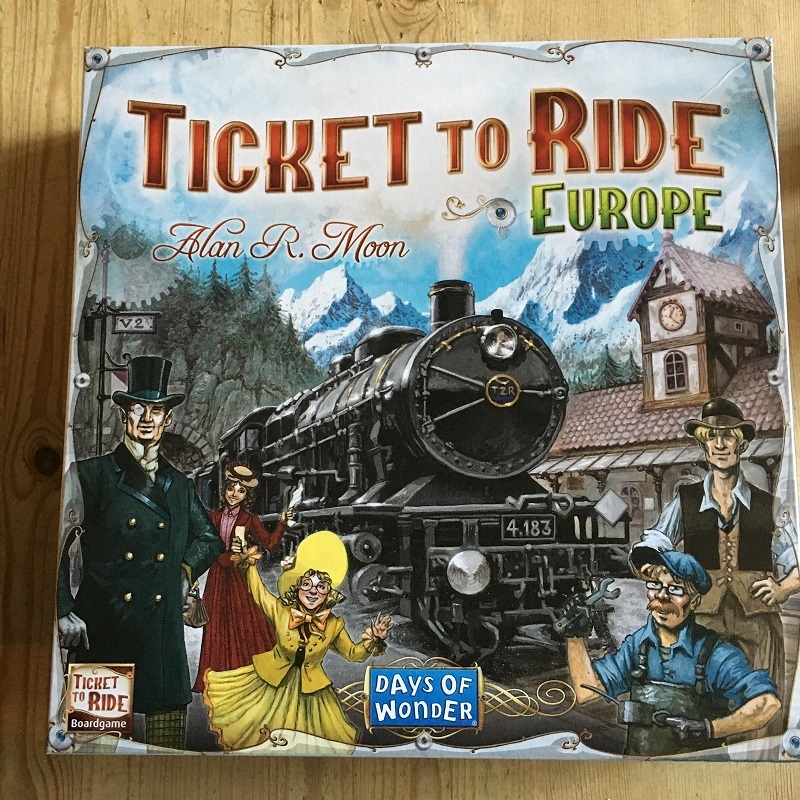 Ticket to Ride is available on Amazon (affiliate link) and is suitable for all children who can read a bit and count up to 10. 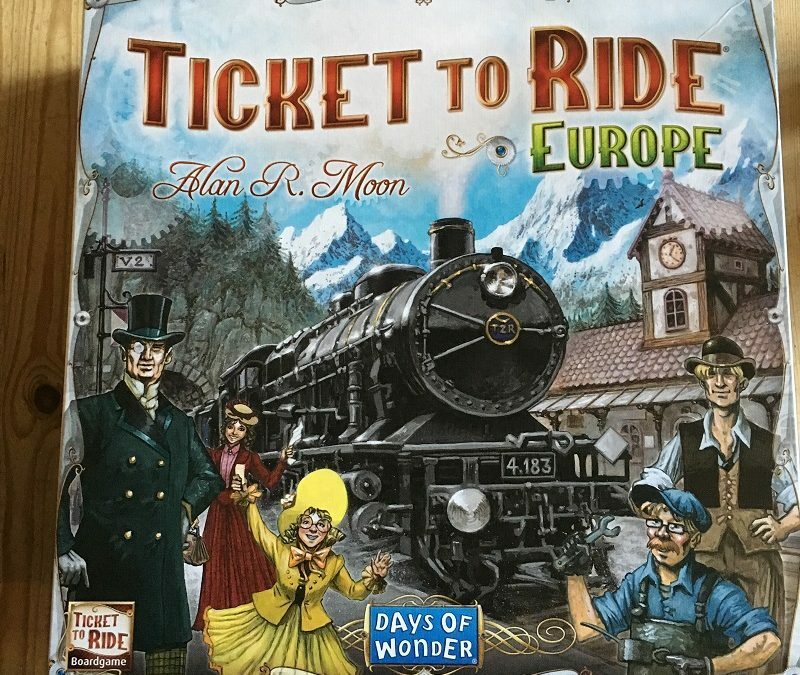 So the nice people at Asmodee have sent me another copy of Ticket to Ride which I can give away to one of you. The game is exactly the same, but the map is a map of Europe instead of America. So if you would like to get hold of a copy of Ticket to Ride then please fill in the Rafflecopter below. I think it would make a great game for any family for Christmas. Lisbon would be lovely as I have never been there and it should be nice and warm. I’d like to visit Paris because it’s a beautiful city with great food. Paris, we went there on our wedding anniversary years ago, would love to go again! Athens;such an ancient history and so much to see in lovely sunshine. This looks amazing. My travel mad husband and daughter would love this. Lisbon is somewhere we would like to visit next I think! Many thanks for this lovely review and giveaway. Reykjavik for the amazing scenery and the shopping! Berlin to visit their Christmas markets. I would love to visit Venice, Florence or Milan anywhere in Italy really it is such a beautiful country! Paris, it sounds so romantic. Zurich looks very nice. There are lots of beautiful lakes around the city to explore. I want to visit Rome again. I had a day trip there on holiday many years ago and would love to explore it more. I would love to visit Rome because it has always fasinated me! Rome – As we’ve never been to Italy. Rome, for the food and to visit the great landmarks! I have been very lucky and have travelled a lot – 1 place I have never been in Copenhagen, I have wanted to go for years and never did get around to it, I’m having a baby in January so I think my next trip will be a long way off. Amsterdam – i would love to go there, the canals and the bikes! Palermo – have always wanted to go here – amazing food & wine! Would love to visit Budapest as I’ve never been to eastern Europe.